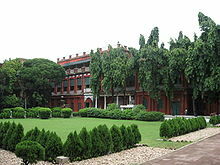 Jorasanko Thakur Bari (Bengali: House of the Thakurs (anglicised to Tagore) in Jorasanko, north of Kolkata, West Bengal, India, is the ancestral home of the Tagore family. It is currently located on the Rabindra Bharati University campus at 6/4 Dwarakanath Tagore Lane Jorasanko, Kolkata 700007. It is the house in which the poet and first non-European Nobel laureate, Rabindranath Tagore was born. It is also the place where he spent most of his childhood and died on 7 August 1941. It was built in the 18th century on the land donated by the famous Sett family of burrabazar to Prince Dwarkanath Tagore (Rabindranath Tagore's grandfather). Gurudev Rabindranath Tagore (1861–1941) was born here. The house has been restored to reflect the way the household looked when the Tagore family lived in it and currently serves as the Tagore museum for Kolkata. It offers details about the history of the Tagore family including its involvement with the Bengal Renaissance and the Brahmo Samaj. Apart from the heritage routine, Rabindra Bharati University organizes regular cultural programmes on the poet’s birthday, Panchise Baisakh, when thousands flock to Jorasanko Thakur Bari, and on other occasions, such as his death anniversary, Baishe Shravan. It also organises a festival of arts, Aban Mela. ^ "Jorasanko Thakurbari". Archived from the original on 28 July 2012. Wikimedia Commons has media related to Jorasanko Thakur Bari. PIB Press Release on Film Awards - The award for the Best Direction for the Year 2001 was given to Buddhadeb Dasgupta for the film Jorasanko Thakurbari for artistically unfolding the history of the house of the Tagores. This page was last edited on 28 August 2018, at 11:12 (UTC).